a man lost his life as a result of this accident involving a tree,” he said. “My thoughts and prayers are with the man’s family at this very sad time. “You just never know the minute. A spokersperson for the Fire Service said, “Northern Ireland Fire and Rescue Service (NIFRS) received a call at 11:27am to a one vehicle road traffic incident at the Hillsborough Road in Lisburn on Thursday. “Five fire appliances were deployed to the scene including the local Specialist Rescue Team. Tragically, one man was fatally injured as a result of the incident. A number of people took to social networking website Facebook to pay tribute to Mr Bell. Lisa Anderson said: “A family friend of ours. Absolutely devastated on Friday lunch-time when I heard. RIP Davy. The Hillsborough Road which was also closed for some hours on Friday caused morning traffic chaos for commuters. One motorist claimed that he had been working in Lisburn for years and the traffic chaos on Friday was the worst that he had ever seen. There were many snarl ups with some motorists claiming that it took them up to two and a half hours to drive into the city due to closed roads and diversions at Hillsborough Road. 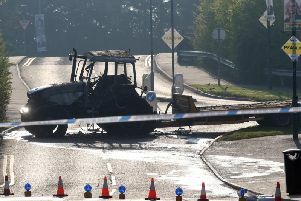 “I left my home in Banbridge at the normal time and I should have been getting into work for 9am,” said one motorist. “Instead I was in work for 10.30am. It took me over two hours alone to get from the Sprucefield roundabout to the centre of Lisburn. A spokesperson for the DRD said that it was a matter for the police and a spokesperson for the police said that the closure was necessary while they continued to carry out their investigation. “Local police closed the road primarily because of a fatal road traffic collision, so investigators could examine the scene,” the spokesperson said.